In West Philadelphia born and raised (sing it if you know it!). 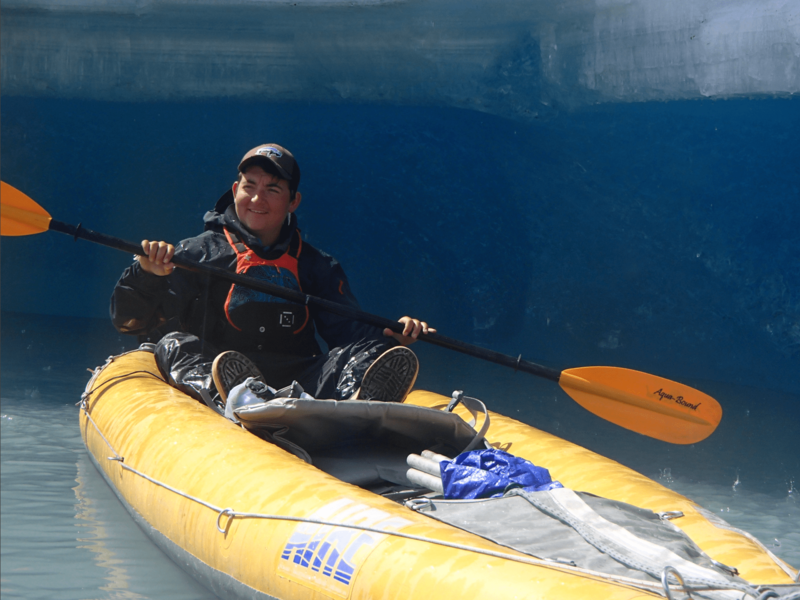 . . I’ve been enjoying summers sea kayak guiding in Valdez since 2011. 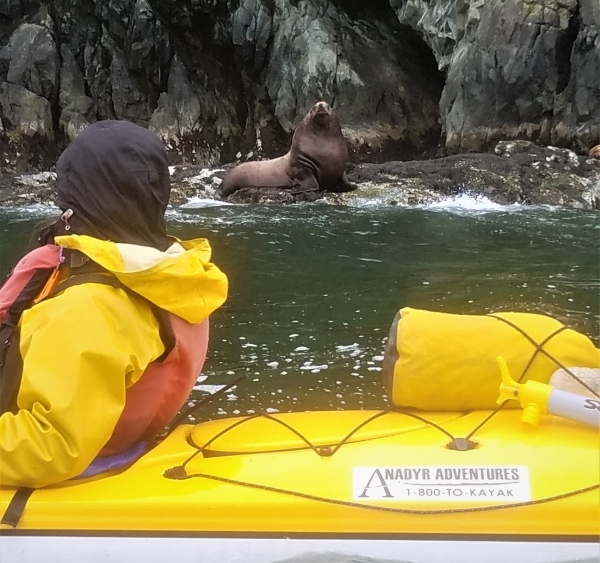 I must really love it here:) I received sea kayak guiding certification in British Columbia, Canada, and recently became a certified kayak instructor. Eastern Prince William Sound is one of my favorite places to paddle. No matter how many times I visit places like Glacier Island, Columbia Glacier, and Valdez Glacier I am amazed and humbled by the beauty, the wildlife, and the ice. I’m excited to share with you these spectacular places! I spend my winters thawing out in the Caribbean of Panama, where I continue to sea kayak guide in the San Blas Islands. Visit my website and blog www.ileneinakayak.com to learn more about me and to see photos from these wonderful places. Having lived on the sandy gulf beaches of Florida and up in the mountains of western North Carolina, I went on a quest to find the perfect combination of land and sea and Valdez definitely fits the bill. I spent the last six months exploring and paddling in Chilean Patagonia. It was there where my passion for paddling and exploring the natural world grew to a point where I could do nothing to subdue my desire for more adventures and so I drove northwest to the most beautiful place I could imagine. I am ecstatic to get to show you the breathtaking coastline of Prince William Sound and take you closer to things you wouldn’t otherwise be able to experience in quite the same way without a kayak. Many of us, as humans, have lost our depth of connection to the natural world all around us and I hope that on your trip with us, you can rekindle this instinctual connection and feel a bit more at peace and also more aware of this planet we call home. Aidan grew up exploring the wilds of New York City, Rome and Central Scotland. Now he spends his summers exploring the wilds of the Prince William Sound. Sharing the beauty of our nation’s wild places has been a passion that he’s been lucky enough to turn into a profession. 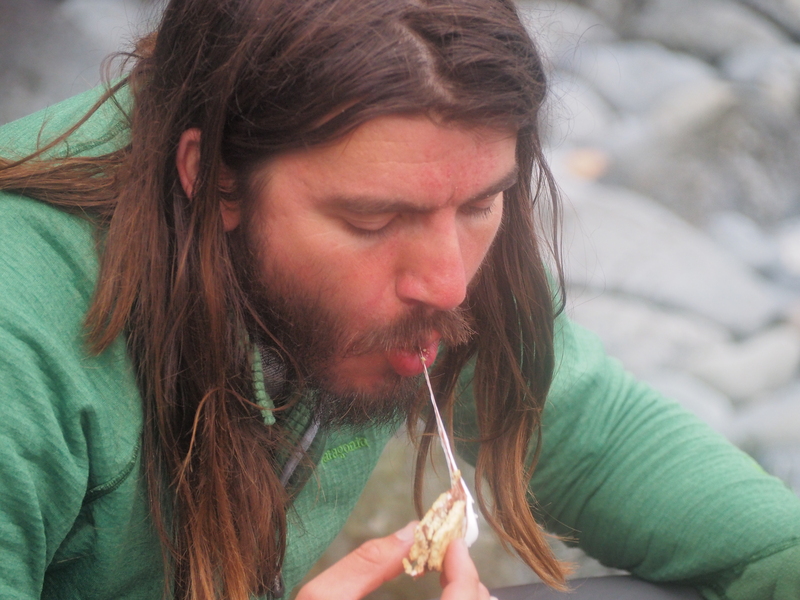 When not guiding people around the beauty of the Valdez area he can be found teaching children about nature in California, cutting trails in Colorado, or relaxing on the beach in Panama. 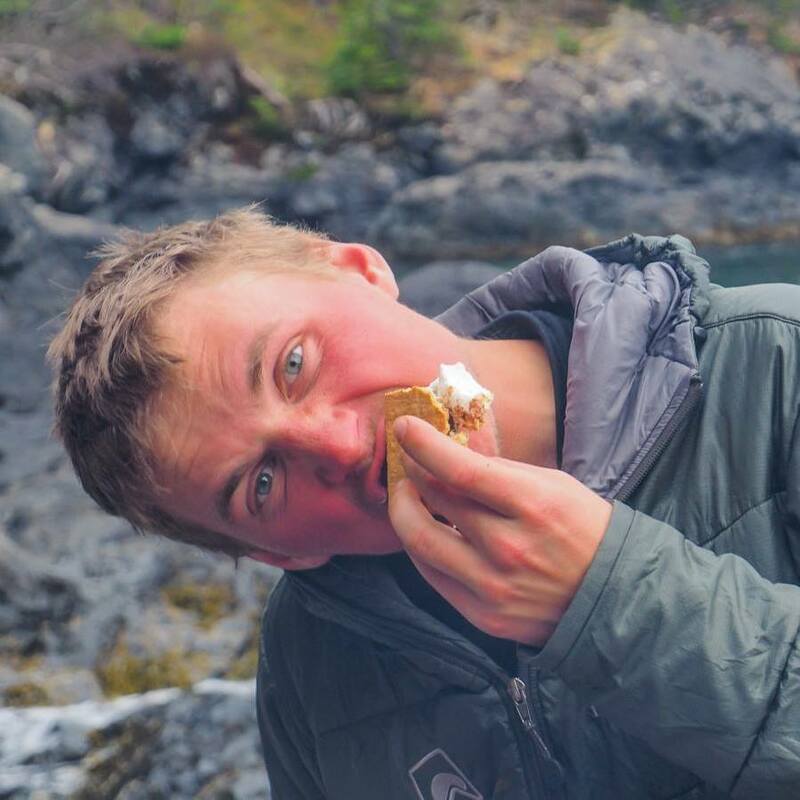 As a certified sea kayaking instructor, a Leave No Trace master educator, a Scottish Mountain Leader and with a degree in Environmental Science and Outdoor Education, Aidan is joining us for his 4thseason and couldn’t be more excited to share his knowledge and love of the sound with anyone who’ll listen. I’ve lived on the tropical beaches of Maui, run through the Hudson river valley, climbed the Sierra Nevada and visited the temple in Jerusalem. But I have finally found the holy of holies here in Valdez. My journey began 3 and 27 years ago in Oakland CA. Through the public school and transit systems I learned to navigate harsh environments and find connections with people in unexpected places. As my hair and beard have grown I’ve taken these skills from the concrete jungle into the wild places of North America. I enjoy reading the landscapes for deep history and meaning. Here in Valdez I am lucky enough to be able to take fellow wandering souls out to the glaciers and bays of PWS to observe the awesome power of mother nature in her raw and pure form. Originally hailing from Emmaus, Pa, Sami is a rock-loving, outdoor enthusiast. She graduated from Bloomsburg University with a BS in Geology. She also spent nine years as a river guide in the Poconos of Pennsylvania until she began travelling the US. She worked in Vail, Colorado and the next summer landed in Valdez. Her love of exploring beautiful places and bubbly personality will certainly entertain you. I grew up moving from place to place and perhaps as a result, my natural state is wandering. From mountains to rivers, deserts to oceans, or country to country, I feel most at home while exploring the amazing experiences the world has to offer. I got my bachelor’s degree in Evolutionary Biology & Ecology at Washington State University and after realizing that playing outside can be a job I haven’t looked back. A few of my favorite things are giant burritos, dance parties, and digging in the dirt. I am loving Alaska and paddling Prince William Sound’s coastlines, I can’t wait to share this incredible place with Valdez adventurers! My passion for outdoor recreation began while growing up in the heartland of the U.S. in Des Moines, IA. While Iowa is indeed home to millions of acres of agricultural land, a lesser known fact is that there is also dense, rolling forest alongside lakes and rivers. These areas welcome activities ranging from hiking, biking, sailing, and paddling. On a recent canoe trip with a friend along the Upper Iowa River, in addition to seeing loads of wildlife, we discovered a limestone arch! I moved to Valdez this summer after living in the great state of Colorado for the past 6 years, where my interest and love for the outdoors grew exponentially with every adventure through the Rockies and every quest into the desert. After working with the Southwest Conservation Corps this past year, I decided I wanted to participate in outdoor education. I believe that experiencing wilderness firsthand often leaves one with a renewed respect and wonder for the outdoors, and Valdez provides the ideal environment for natural immersion. I cannot wait to share all the beauty and history that the Prince William Sound has to offer with you!